IndyBikehiker: DO CHRISTIANS RESIST PEACE? We claim personal peace with Christ, but do we believe relational and international peace is Biblical or possible? IS PURSUING PEACE NOT CHRISTIAN? I recently recommended four books that are breakthrough resources on practical peacemaking and nonviolence. They have nothing to do with protests, vigils, marches or sit-ins. They are more about the underpinnings of our thinking and processes that either contribute to or prevent peacemaking. 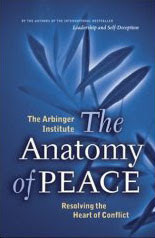 The books are: The Anatomy of Peace, Leadership and Self-Deception, Nonviolent Communication, and The Different Drum. However, the books are not particularly Christian. Three are not Christian at all. But neither are these resources anti-Christian or sub-Christian. Rather, they are insightful in their process and proven outcomes regarding how people can better understand conflict, respond to it redemptively, and live beyond age-old terms that tend to recycle past, self-defeating responses. LIVING WHAT WE'VE EXPERIENCED. Here's why I recommend these books--particularly to earnest Christians: I am convinced that many Christians have had a genuine personal spiritual experience of Christ’s peace (John 14:27; 16:33), but they do not have the language, patterns, or principles by which to translate that personal experience into truly nonviolent living, peace-full relationships, and helpful leadership in community and international problem-solving. Many Christians experience Christ's peace, but then follow teachers, read books, and give assent to political evangelists that promote sub-Christian perspectives on conflict and its resolution. I think the resources I've recommended, if read critically and in a robust dialogue with one's own Biblical faith, can significantly contribute to living out more fully the witness to peace which personal faith makes possible. PARTLY NONVIOLENT? I made a commitment to try to live nonviolently in every possible dimension of my life several years ago, partly out of a response of faith to the words and witness of Jesus in the Bible, partly out of my conviction that Christian theology points toward it, and partly because I am convinced that the way of violence, under whatever justification, is an insane and costly denial of all that is intended for us in life and in relationships near and far. I no longer buy the line that violence, though regrettable, is necessary as a way of resolving conflicts or moving toward peace at any level. TO LIVE NONVIOLENTLY. Yet the language of violence and anger, I have found, pervades our conversations and common thinking as much as ever. It still profoundly impacts the most basic relationships and problem-solving challenges. But it is no longer enough to just not use physical or verbal violence. Something greater is called for and pointed toward. I want to bring nonviolence to fully into practice in my relationship to my spouse, children, friends, neighbors, community--especially when differences of opinion, tension and conflicts arise. Understanding and addressing violence and embracing the best practices and creative possibilities of nonviolence, community-building, and peacemaking are critical at this point in my life and, I believe, in the life of the world.